The 20th volume of the journal Slavia Meridionalis will be devoted to the relationship between intellectuals and the religious. The main focus of our attention are South Slavic cultures, we are nevertheless also interested in the West Slavic context, as both these areas have, to some extent, been subjected to common historical and political processes. Until the First World War, it was an affiliation to one monarchy with state religious policy, and after the Second World War – being included in the orbit of communist influence with a policy towards religion, which although in principle uniform, was inevitably nuanced by local traditions, social attitudes, and models of religiosity. According to secularization theory, as a result of modernization processes, religion was to disappear or at least lose its social meaning. The experiences of recent decades have shown that this claim was prescriptive and that it was in fact entangled in the (post-)Enlightenment progressive narrative. Speaking, however, of a simple "return of/to religion" is also unjustified, because the way religion is understood and functions in the public and private spheres has changed. In the conditions of modernity – which is understood in a broad cultural and philosophical perspective referring to the (post-)Enlightenment thought – religion has been rediscovered, but also reinterpreted from many different, including heteronomous, points of view. This fact has manifested itself not only in the ennoblement of various quasi-religious experiences and practices, but also in the "discovery" of their importance in social life, and even the recognition of the (quasi-)religious background of cultural facts by researchers representing starkly different scientific disciplines and worldviews. "The religious" is thus a term which signals the shift that has taken place in the research on the religious sphere in general, and includes not only the traditional concept of religion, but also sense-making horizons that are diverse in their genesis yet all founded on a (quasi-)religious element. It also opens us to "religion" as a descriptive category of experiencing and understanding the world and allows us to look at "traditional" phenomena in a new light. A special role in verbalizing and problematizing the religious (or the non-religious) belongs to intellectuals, understood broadly as individuals who have a predisposition to view the world critically. From the point of view of intellectual history, their statements are key testimonies of human thought, which is why attention is merited both by figures from various canons of knowledge, of established authority and importance for the history of culture, and by outsiders or those forgotten. Their worldview entanglements, as well as the ideological background of the judgments they formulate, should be the subject of in-depth research – as key elements for the understanding of broader cultural phenomena. In the light of this new thinking about the religious, the situation of Slavic countries, whose cultural and historical context differs from that of Western Europe, seems to be particularly interesting. One of the differences is expressed in alternative conditions of secularization processes – and in alternative experience of the social and existential function of religion. For example, secularization as a rejection of religious faith and cultural practices and as the withdrawal of religion from the public space was officially propagated in this area, or even enforced under the communist regimes. As it turns out, however, the religious remains in force, and religious tradition is still an important reference point for national identity and local literature, art and philosophical thought. The place of intellectual elites in the sphere of religious-related phenomena has always been varied in a multidimensional way; in individual cases it has also been subjected to the dynamics of cultural and political changes and characterized by ambivalence, which is associated primarily with the particular history of the formation of this social group, its function and significance within the state. It is precisely because of the various (post)modern and (post)secular shifts in the humanities of recent decades encapsulated by the notion of the religious, and the specificity of Slavic cultures, symbolized here by (but not limited to) the alternative experience of secularization processes that the relationship between intellectual elites and the religious in this area – especially, but not exclusively, in the conditions of modernity – is worth revisiting, particularly from a comparative perspective. 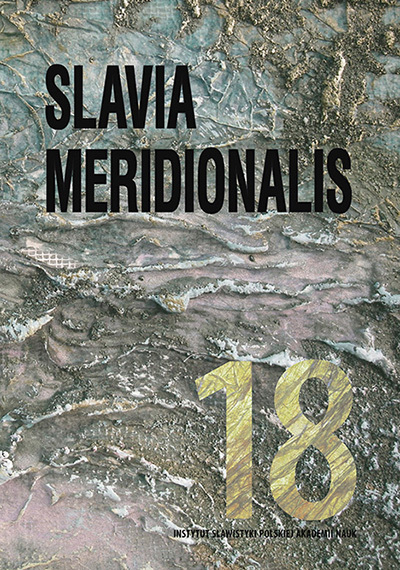 Slavia Meridionalis is a multidisciplinary Open Access journal presenting research on the South Slavic countries and their connections with other cultural regions. It is listed in ERIH PLUS and indexed in SCOPUS. We invite papers by representatives of various research areas and methods. We are likewise interested in comparative reflection and references to the whole area of the Slavic cultures and the Balkans. We will also consider publishing articles outside the main topic – in the "Imponderabilia" section, which is intended for papers addressing particularly important issues related to the Slavia Meridionalis area. We welcome papers of up to 40,000 characters with spaces (including bibliography) in all Slavic languages and English. Autorów zapraszamy do przesyłania artykułów o objętości do 40 000 znaków ze spacjami (wraz z bibliografią) we wszystkich językach słowiańskich oraz angielskim, niemieckim i francuskim. Editors-in-Charge of the issue [Redaktorzy Prowadzący] 18/2018: Viara Maldjieva, Irena Sawicka, Anna Boguska, Ewa Wróblewska-Trochimiuk. Language and stylistic editors [Redaktorzy językowi]: Matthew Chambers (English/angielski), Barbara Grunwald-Hajdasz (Polish/polski), Greta Kominek (Bulgarian/bułgarski), Ana Marković (Croatian/chorwacki, Bosnian/bośniacki), Marjan Markovikj (Macedonian/macedoński).